American Airlines is sending layoff notices to over 11,000 employees as the company goes through bankruptcy reorganization. ­The layoff notices were sent to mechanics and ground workers whose jobs will be affected by the company’s attempt to streamline. Nearly 3,000 workers will be affected in the Dallas-Fort Worth area, where a maintenance facility will close, and nearly 3,000 more at a base in Tulsa, Oklahoma, as well as 1,200 workers in Miami, 1,100 in New York and Newark, N.J., and 900 in Chicago. Previously the airline planned to cut 14,000 jobs, including 13,000 held by union workers. This week American Airlines spokesman Bruce Hicks has said about 4,400 employees would lose their jobs. US Federal law requires the company notify anyone whose position could change. 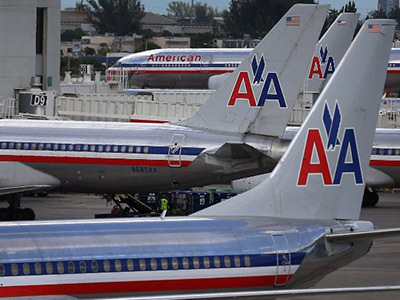 This summer American accepted slightly smaller cost-cutting measures, agreeing to give bonuses to flight attendants and ground workers who quit. So far 1,800 flight attendants and 800 ground workers have applied to accept the bonuses. “As bad as this is — and we knew this day was coming — we’ve been able to lessen the pain,” Jamie Horwitz, a spokesman for the Transport Workers Union, told the New York Times. Separately, the leader of the pilots’ union denounced the company, saying it is using the bankruptcy process to wring punitive cost-cutting concessions from pilots. American Airlines operates about 1,700 flights a day, and has recently canceled more flights than other major U.S. airlines. These cancellations and delays were mostly due to an increase in pilot sick days and greater maintenance reports by flight crews.